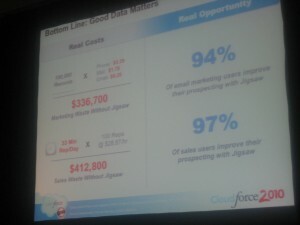 Lessons for for sales and marketing from Salesforce.com Cloudforce show in San Jose. Yesterday, over 1,000 people came together in San Jose (plus 10K more on a live video feed) for the launch of Chatter at a Salesforce.com Cloudforce event. The attendees included developers, administrators, sales people, press, analyst, marketers and more – with information for each group presented throughout the day. 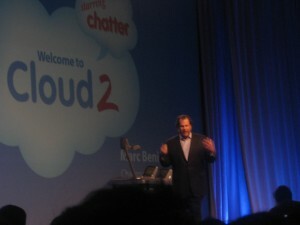 As expected, the day kicked off with a discussion about Chatter, Salesforce’s approach to enterprise social networking. Marc Benioff, Chairman & CEO of Salesforce.com, set the stage with a video explaining how the world now majorly communicates using social media. He explained that in order to reach 50 million users, radio took 38 years and television took 8 years. The Internet took 4 years. Facebook reached 50 million users in 5 months. This type of change causes people to pay attention. The Salesforce.com product team was paying attention to that change. And Chatter was born. However, the entire day wasn’t only about Chatter. 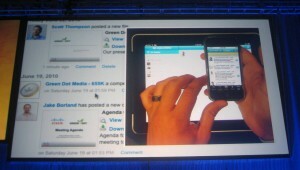 Many new features in the Sales and Service cloud were highlighted in the keynote and during breakout sessions. In this post, I will run through what was most relevant throughout the day for sales and marketing. The big concern for many about adopting Chatter into their organization is that Chatter will waste time. Fear not. While it will take more time in your CRM to read what’s happening via Chatter, it has the ability to reduce internal emails drastically. During one of the breakouts, a Salesforce.com rep explained how Chatter reduced their internal emails by 40%-50%. Essentially, you’re trading off the back and forth conversations, opting for a richer collaboration of ideas. Jigsaw’s new, super-awesome integration (no, that’s not the technical term) will allow you to clean up these records. The system actually makes an annotation when it believes a lead or contact has incorrect information, ensuring your marketing is going to the right people, and your sales team isn’t spinning their wheels when no one is on the other end. Kevin Akeroyd, COO of Jigsaw, explained their 800 customers (70% Salesforce users) are excited about this integration and expect their customer count to grow rapidly. Oh, and do you have International needs? They’re going global this fall. 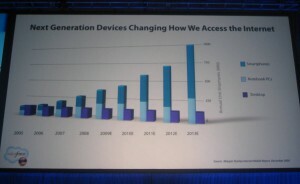 Many of these efficiencies come via applications on your mobile device. Salesforce is creating an iPhone app for Chatter that works in real time allowing a Sales rep to preview documents, interact with team members and more. And these apps can extend onto your iPad as well. With 3 million iPads sold in 80 days, (about the same rate of growth for iPhones – 3 million in 74 days) companies should not ignore how they can leverage this technology for their organization. Outside of product enhancements, there was much for marketers to learn throughout the day. First, marketers should also take note to some trade show best practices. Salesforce has the highest concentration of customers in the Bay Area- so this was a perfect location for a launch of a major product announcement. 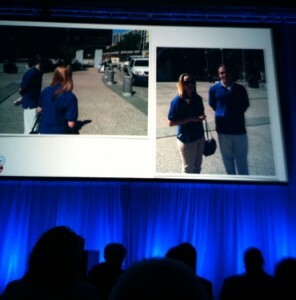 They drove over 3,200 registrants and filled the keynote with over 1,000 people. To help fill seats, Salesforce gave away 1,000 Flip cameras. While this might seem like a great way to drive attendance, this had another, and potentially greater, benefit. These Flip cameras could be used by attendees to capture the excitement of this event, which could then be shared with their friends, coworkers and other business associates. Salesforce also does a great job managing multiple partners, helping them gain reach. This is often tricky for marketing and business development teams because partners are often competitors, making it hard to interact with multiple at one time. Two Salesforce partners at the event were Apple and Dell. We saw them support both partners by letting both present demos of their products (showing off Chatter). 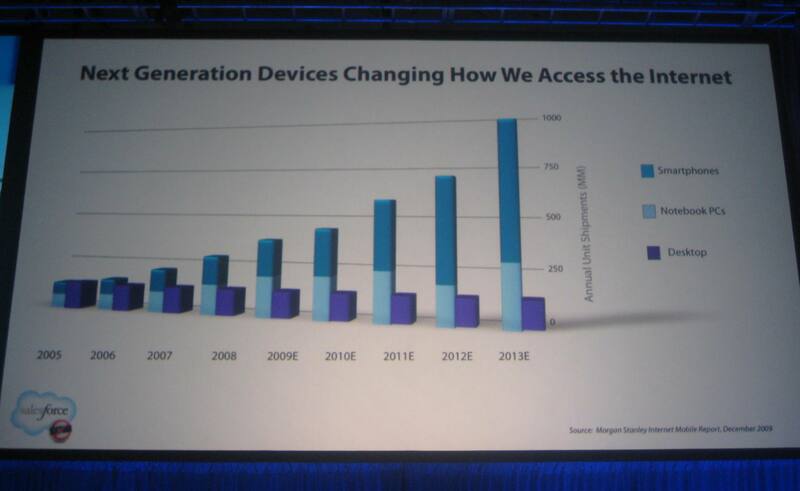 Salesforce also paid attention to the details- having 2 Dell computers and 2 Apple computers on stage. I also saw the event as a great example of how to deal with competition. Microsoft, a competitor of Salesforce, was handing out flyers in front of the expo during the event. Salesforce turned this into an opportunity by putting up picturess of the Microsoft employees at the event, saying they were staging a protest because of Salesforce’s amazing success. A great way to turn the situation around. For many marketers a big theme of 2010 is engagement- creating engagement for prospect, customers, and employees. One way to create engagement is through positive social efforts. Salesforce did this by highlighting their philanthropy. During the event, Marc announced his personal donations to the UCSF Benioff Children’s Hospital at Mission Bay. He not only had thousands cheering for Salesforce because of this, but was also able to showcase the Salesforce product by asking everyone to give feedback and ideas on ucsfbenioffchildrenshospital.org, which is powered by Salesforce. For every sales and marketing professional looking to sharpen their skills this was a great event. I will continue to post upates about Salesforce.com product, features, and events on this B2B blog so please take a minute to subscribe if this is important to you. For marketers also trying to stay up-to-date with all things Salesforce, check out my cheat sheet about Salesforce for Marketers.